Jim Cloern looked out of an airplane window one day and saw red streaks in the water; crimson patches darkening the grey-green shallows that are San Francisco’s South Bay. A superscientist with the US Geological Survey, he knew something big was happening. As soon as the plane landed he called his crew. “You will not believe the explosion we’re seeing on the surface,” he heard back from his crew leader Tara Schraga. A quality control freak who sticks to the gold letter that is attached to everything labeled ‘USGS science,’ Schraga had spent the morning on their research vessel lowering sensors down into the shallows and then pulling them out again to log the levels of salt, nutrients, sediment, and phytoplankton between the surface and the bottom oozes. It turns out that the tiny drifting plankton visible from the airplane window on that day in 2004 were blooming on the Bay’s surface in record amounts. The color indicated a red tide, a harmful algal bloom, like those that closed Florida’s white beaches and made Miamians cough during the 2018 elections. I asked Cloern, a humble guy with a big brain who just retired after 43 years as a scientist specializing in the San Francisco Bay, if he ever gets tired of plankton? “That would be like asking John Muir if he ever got tired of trees,” he says. Spring 2019 finds USGS – the non-partisan, top-of-the-line federal science service paid for by our tax dollars – in the midst of a restructuring that includes not hiring someone new to fill Cloern’s supersize shoes. Word is the agency is thinking of shifting its water division into National Weather Service style monitoring mode, and cutting coastal research programs like Cloern’s that make up less than five percent of the national budget. 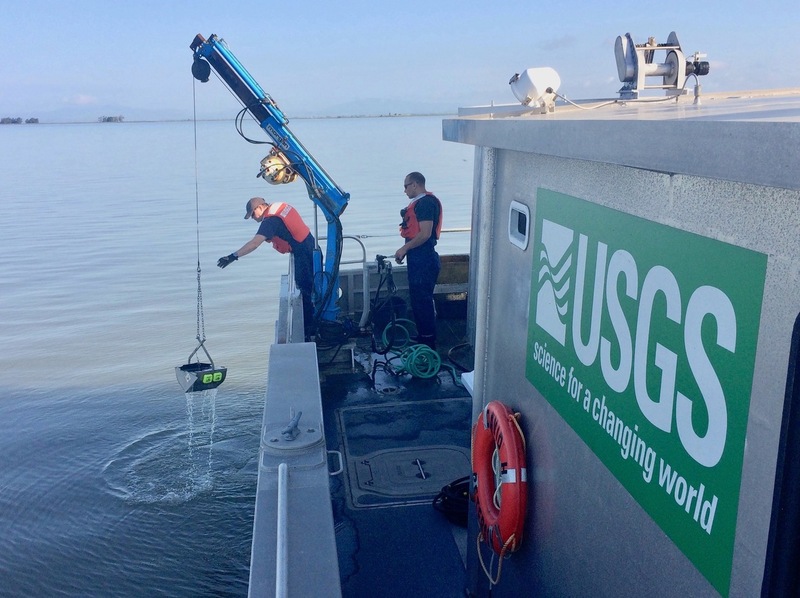 The thing is, it’s a really bad time for the San Francisco Bay to be in limbo – not knowing if it will be able to replace this brainpower or sustain USGS’s 50-year-old, boat-based bay water quality sampling program. As conditions change, more red tides may be on the way – bad news for shoreline communities, Bay health, the local economy, and wastewater treatment plants who might be forced to make significant and costly upgrades to prevent them. Cloern is one of the few that might recognize that red tide from the air or water and be able to tell you what combination of conditions produced it. The data his program has collected would reveal how often these same conditions had occurred in the past 50 years, and a half dozen computer models supported by this data might be able to predict how often or when they might occur in the future. “The system most likely to catch us with our mouth open by changing dramatically is the South Bay,” says Cloern’s long time colleague at USGS, Jan Thompson, an expert in the clams and other invertebrates down in the oozes that eat plankton. She too is due to retire and not be replaced. “We still don’t know exactly why the South Bay isn’t pea soup eutrophic today, if it’s something good we should market it and sell it, but it could be something bad like a contaminant holding blooms in check,” she says. Putting all the pieces together – conditions plus climate plus clams plus contaminants, among other estuarine complexities – is the kind of thing this program has always done best. SFEI’s Erika King captures a Bay sample on a March 2019 cruise on the USGS vessel R/V Peterson. Photo: Nebiat Assefa Melles. Decisions higher up in the USGS water division suggest the program and its lead scientist position could sunset as early as August 2019 or not at all – the uncertainty is crippling. USGS’s local and state partners in science are now scrambling to see if they can pick up the slack. And while making locals pay for coastal estuary research – especially in a flush region like northern California – may seem like a quick way to free up more bucks for national initiatives, many prominent people don’t see it that way. When Cloern describes the conditions that led to a red tide in the South Bay, I can’t help thinking of cooking. He says unusual weather, calm winds, stagnant water, and record high air temperatures “stratified” the bay into layers of fresh and salty, warm and cold water. The layers enabled the phytoplankton to swim up to the surface and stay there, rather than sinking to the bottom to be scarfed by filter feeding clams. Up there in the sunlight, away from consumers, they bloomed and bloomed. Some blooming is great for the food chain; too much can be toxic. Most people looking at the Bay would not see all this variety hidden under the milky surface. In fact the Bay is more like a complex stew than a basic broth. To understand how all the textures and flavors affect each other, let alone what happens when you add salt or sugar, lower the heat, or overstir, you have to be a kind of master chef. The way Cloern talks, you can hear the little grey cells processing decades of data, observations, experiments, and wisdom to conjure the red tide recipe. No one is a master chef or superscientist (an actual USGS classification) overnight. In Cloern’s long career, the Bay has “flipped,” as some scientists call it, a number of times. First came the invasion of the Asian overbite clam in the 1980s, a creature that can filter the entire water column within a day. The second time occurred in 1999, when the Bay’s phytoplankton suddenly began blooming in autumn rather than spring. “I thought we’d made a mistake, we went back and double checked everything,” says Cloern, who had recorded spring blooms for 22 years prior. But that flip – which he later figured out was the result of a change out in the Pacific Ocean that produced more flatfish, crabs and shrimp than in past years, species that then migrated into the Bay and ate a lot of clams, clams that in turn stopped scarfing plankton — is just one more example of the ever changing nature of estuaries. “Most of the things I’ve worked on I couldn’t have anticipated,” says Cloern. USGS’s national budget for research has declined in real dollars from around $700 million in 1996 to $650 million in 2017. Cloern’s coastal research and bay monitoring program is down to a mere $760,000 per year in cost today. All scraps compared to a $5 billion border fence or a $13 billion space force. Yet this USGS science serves Americans every day – tracking storms, measuring snowpack, steering airplanes, saving salmon, monitoring water quality, modeling the cascade of effects that occur with climate change, namely interpreting our changing world – as the USGS slogan goes. Nationally, while total research and development spending by the federal government is at an all-time high, it has steadily declined as a percentage of the country’s total GDP, from 1.05 percent in 1980 to 0.615 percent in 2016, according to articles in Scientific American and analysis by the National Association for the Advancement of Science. Sure, the national federal funding stream may have declined, but one big contributor to the local uncertainty has to do with one federal agency shafting another. Since Silicon Valley’s state-of-the-technology and bio-med labs for the likes of Google, Genetech and Stanford flourish all around, the feds very own GSA (General Services Agency) insists on charging USGS commercial rate rent for the Menlo Park building. Last I checked, nobody could afford commercial rates in Silicon Valley except the one percent. Where Cloern once worked with more than half a dozen full time scientists, his current permanent staff amounts to a single part-timer. Personally, all this makes me depressed. When I was a little girl, my Dad and I used to climb around Yosemite using maps sketched, ground-truthed, printed, and waxed by USGS. The minute detail of a drainage dip or rocky promontory on each map saved us from getting lost countless times. When I grew up to be an environmental writer, I always found USGS scientists and studies at the frontiers of understanding how we as humans were fouling our own nest. When I shifted to science journalism, I learned that any USGS source was golden: fact checked, peer reviewed, decorated with so many caveats, footnotes, and citations it drove those of us trying to simplify the story for common consumption crazy. This science, to me, was a true mark of the greatness of government. My science, paid for by my tax dollars, free of faith and unsullied by dark money. Here in the watershed of San Francisco Bay, USGS science is the fourth leg of dozens of chairs at the head table. The 50 years of Bay monitoring data and observations, interpreted by Cloern and his team for decisionmakers and regulators, has become an integral part of the regional science enterprise. Removing that leg from each of those chairs for less than a million bucks would topple dozens of ongoing programs that underpin management of California’s water supply, economy, endangered species, fires, floods, wastewater treatment services, and more. Take for example the Interagency Ecological Program for the Delta, which relies on USGS to cover the lower watershed. “Our authorities here in the Delta may be circumscribed, but as scientists we know we can’t really limit ourselves to one area of a very large watershed, it’s all connected,” says Steve Culberson, lead scientist for the IEP. Culberson says the IEP might never have noticed the pattern of decline among multiple pelagic fish species in the Delta all at once (aka the “POD”) without this kind of mindset. “Cloern’s program helped teach us how to tease out those patterns with analytical methods, methods that were then borrowed and applied by people up here,” says Culberson. To sum up, the degree of collaboration and integration among the region’s monitoring systems, though far from perfect, risks a domino effect from the loss of the USGS leg. At a minimum, locals are hoping for a basement level investment in Bay monitoring from the feds, but what they’d really like to see is a renewed commitment to coastal research and science staff. The Bay stank in the 1960s, and it could stink again if we’re not careful. Rotten egg fumes wafting into the Google courtyard at lunch hour might not mix well with the organic greens, cilantro chicken, and artisan root beer. The main driver of that potential stink up is nutrients. 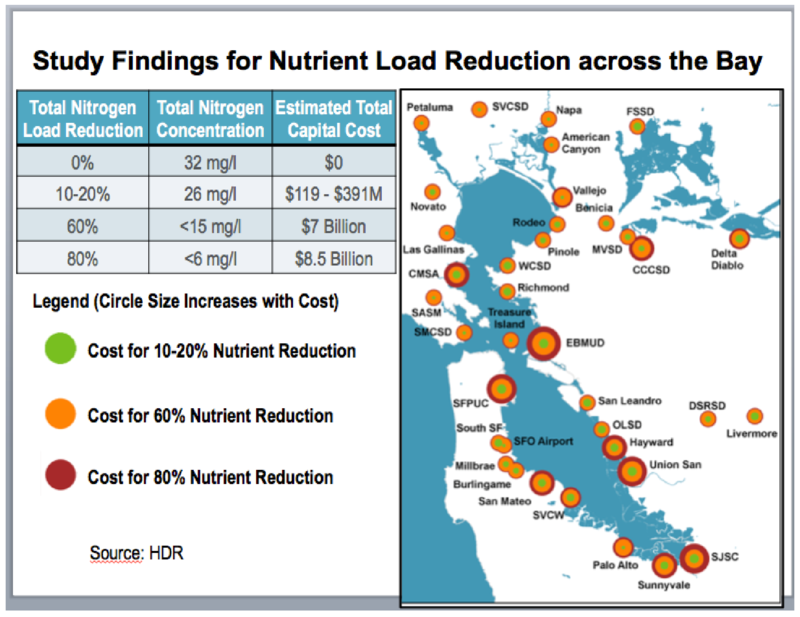 These nitrogen-containing compounds run off our hillsides, streets, and farms into Bay and Delta waters, but in San Francisco Bay the majority comes from the wastewater discharges. There’s a lot in most estuaries, and Cloern says the Bay is in the top 10 percent worldwide for nutrient loadings. For decades, however, something has prevented nutrients from sparking and fueling the kind of plankton growth that robs the water of oxygen and produces toxins. Toxic algae blooms affect many waters of world and have been especially problematic in places like the East Coast’s Chesapeake Bay and, more recently, Florida’s Atlantic beachline. There last fall’s toxic bloom killed manatees, dolphins, sea turtles and at least one whale shark. Former Florida Republican Governor Rick Scott received blame for previously cutting the state’s water management budget and, by some allegations, contributing to the conditions that caused the algal explosion. His actions as governor included relaxing requirements on septic system inspections, which may have allowed a surge of sewage-tainted runoff to enter waterways, feeding the toxin-producing algae. The state’s new governor, Republican Ron DeSantis, has vowed to turn the tide. Two days after being sworn in in January, he signed an order that will seek $2.5 billion over four for better management and protection of water resources. The order will empower local agencies to curb nutrient loading of waterways and hopefully prevent more ecological crises like that occurred under Scott’s watch. San Francisco Bay has not experienced the magnitude of harmful algae bloom (HAB) seen recently in Florida. Cloern, Thompson, and their USGS and regional colleagues have all attempted to understand the Bay’s resistance to these eutrophic blooms, and tried to figure out if and when that resistance might time out. It all has to do with subtle shifts in temperature, waning turbidity (as gold mining era debris washes out of the system), estuarine mixing, and climate. A combination of unidentified factors is likely at play. It may not be long now. HABs increasingly appear in California headlines associated with toxins in the crab catch, domoic acid sickening seals, and dead fish. Monitoring has already established that microcystin toxins from Delta HABs are ending up in the Bay. Downstream, meanwhile, UC Santa Cruz scientist Raphe Kudela, who collects samples from the Peterson, has established that similar toxins originating from Pacific Ocean HABs can be found in the Central Bay. 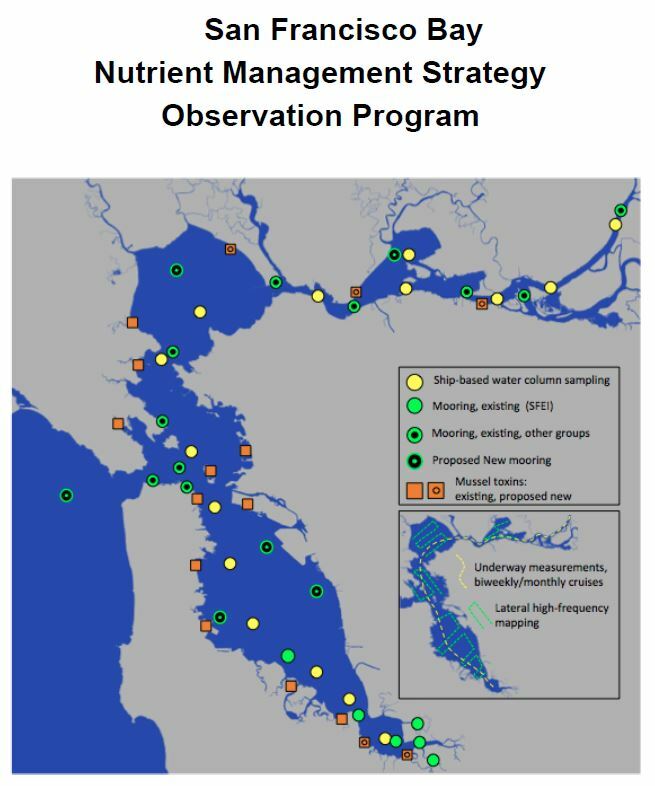 These kinds of early warnings from USGS and its collaborators led the water quality control board to launch strategic planning around nutrient management for the San Francisco Estuary in 2012. 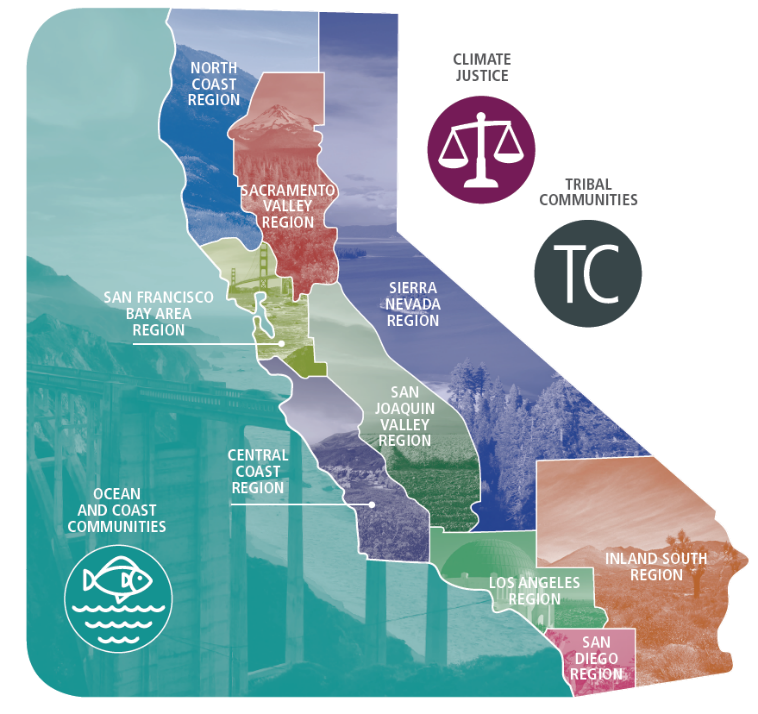 “After five years of capacity building, we’re now diving deeply into answering targeted management and science questions,” says the San Francisco Estuary Institute’s David Senn, lead scientist for the strategy. Regulators need to decide, and dischargers need to know, if they will be required to invest in expensive new treatment systems to remove nutrients. Such an upgrade of the region’s POTWs (publicly owned treatment works) was estimated to cost $5-$10 billion in a recent, exhaustive engineering analysis conducted by HDR consultants (see margin graphic). With other pending pressures on end-of-the-pipe systems, such as emerging concerns about pass-through pharmaceuticals and microplastics, not to mention increasing flood threat to shoreline pipelines and settling ponds from rising sea levels, the importance of good science to tease out priorities is critical. With its gunmetal grey flanks, from afar the R/V Petersen looks like a military patrol boat. But instead of guns, flares, and sirens, it’s equipped with a special crane to lower a CTD in and out of the water. (CTD refers to a high-tech, sensor-loaded device that gathers samples on conductivity/ salinity, temperature and depth). 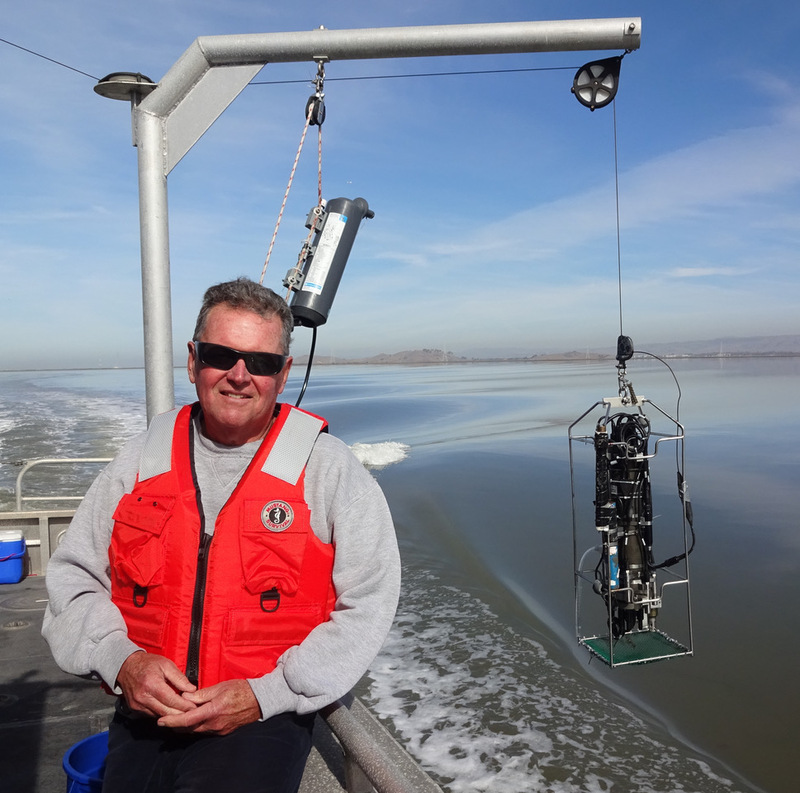 Every month the Peterson visits 32 stations on the water, from south of Redwood City to the Delta’s Rio Vista, and lowers and retrieves the device and all its data. Other onboard bells and whistles include a benthic grab to scoop up bottom samples, sophisticated computers, and a laboratory for processing what comes up on board rather than back in Menlo Park. One of the latest and greatest instruments on board is an Imaging Flow Cytobot, used on the USGS sampling cruises by Raphe Kudela. Bay water passes through the instrument, and each time a plankton cell is detected it takes a photo (see below). “This new technology is opening up brand new perspectives for measuring and understanding changes in this microscopic, but essential, biological community,” says Cloern. With such exciting leaps and bounds in technology, one can’t help wondering if we could do all this Bay monitoring remotely, with satellites and sensors strapped to bridge stanchions and shoreline moorings. Wouldn’t it be cheaper and more efficient? Wouldn’t it be more modern that noodling around the Bay in a boat? Once installed, these stationary sensors also invite all manner of Bay life to colonize them – clamping on with suction feet, sliming surfaces with a green film. “Left unattended, things grow on the instrument housings and sensors themselves, and fine particles clog various parts needed to take measurements,” says Senn. Senn knows from experience. The region’s nutrient management group manages an array of stationary sensors in the South Bay. “The longest we’ve been able to go is three weeks before sensor fouling starts to kick in to an extent that data quality suffers tremendously. Then we have to send someone out to clean them off and recalibrate them,” says Senn. (The Bay hosts a network of other stationary sensors managed by the Regional Monitoring Program and the Estuary and Ocean Science Center — see map, side column). Grabbing samples from the Bay bottom is another thing best done from a boat. These samples get carried back to the Menlo Park lab where graduate students and lab rats sift through the muck, sorting the aliens from the natives, the worms from the slugs, the Asian overbite clams from the native filter feeders that siphon the water for drifting plankton. Yet this benthic ecology component of the Bay’s coastal research program is also slated to end. Thompson is managing a few remaining grants and a skeleton program until she finishes a phased retirement. The best future program, everyone agrees, is some combination of stationary sensors, a boat and crew, and a lead scientist or two with the chops to turn concentration levels into management information. “Without someone interpreting the data it’s not useful,” says Schraga. So just imagine taking a jog with your dog on that new stretch of Bay Trail you like – the one with the pretty purple flowers dancing in the breeze and the steps leading down to the beach. It’s high tide. Your dog chases a ball in and out of the water, upchucks in the back seat of your car on the way home, and dies that night for no apparent reason. While this may sound alarmist, it could happen. Bay Area residents have come to expect a beautiful bayshore and safe, non-sticky, non-stinky water for their pets and children to play in. That cleanliness is a point of pride, another couple of zeroes on your property value, or benefit of your waterfront workplace. That cleanliness, and the science and long term monitoring that contributed to it, is an international, not local resource. 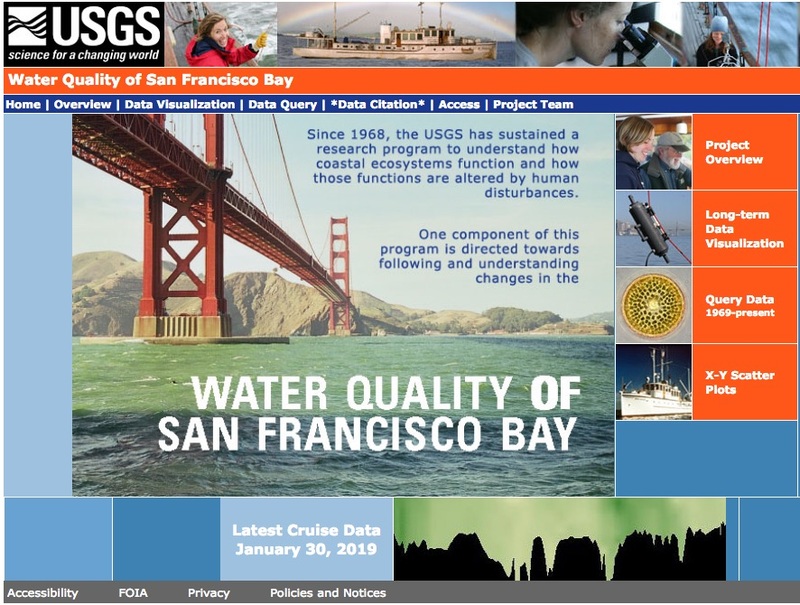 Indeed conditions from year to year, as posted and made available to all on the USGS Bay water quality monitoring web site, serve a much broader audience than just local residents. In 2019, the web site with its downloadable data was getting more than 2,000 visits a day, with users from 90 different countries, ranging from Andorra to Zimbabwe at last look. Could this invaluable resource soon be parked on some obscure federal server? It’s important to remember how much this long legacy of water quality monitoring has paid off economically and for the health of the Bay Area and the nation. What ends up in the Bay comes from a vast watershed and an equally vast Pacific Ocean, not just one small region. “USGS is gathering data coming from more than 40 percent of the land mass of California through a major river system and estuary, with essentially a statewide effect, not to mention a nationwide effect on the agricultural economy. That’s why the Bay Area shouldn’t be paying for it all,” says Dave Williams, executive director of the Bay Area Clean Water Agencies, an association of publicly- owned wastewater treatment plants that serve more than seven million residents of the Bay Area. The Bay Area has already started paying. When earlier shortfalls threatened the USGS program, the Regional Monitoring Program and those managing the water board’s Nutrient Management Strategy stepped up. Together, they managed to bankroll the conversion of the former police boat to a floating science lab when the aging Polaris had to be replaced. They also funded essential crew positions. Funding partnerships have worked in the past to support collaborative monitoring programs, and will work in the future, but local and state agencies don’t want to let the feds entirely off the hook. “For almost anything we do these days, it’s hard to have single payer anymore, but it does seem like the federal government’s whole purpose is to spend money wisely that can benefit large groups of people or places or estuaries like ours,” says Dave Williams. The benefits of continued tracking of nutrients, blooms, red tides, invaders, and emerging contaminants are obvious. For one thing, with its foundation in past conditions, the USGS Bay program could also help us confront major changes to the Bay’s tidal prism from sea level rise – which is slated for 3-6 feet by 2100. The advancing ocean will also submerge Bay mudflats and lessen turbidity, another limit on bloom rates. More and bigger sea walls, built to protect major shoreline infrastructure, will exacerbate circulation problems. “The Bay will be more like a big bath tub, not a good result if you’re worried about HABs,” says Thompson. “In a day and age where children are suing the government for environmental harm, it is absolutely the state’s responsibility to continue this amazing bay research program,” says one of its graduates, Misty Peacock, director of the Salish Sea Research Center in Bellingham, Washington. To comment on this story, or see comments on this story, scroll down. I was first introduced to the wonderful scientists from USGS Menlo Park and the Bay-Delta (BD) monitoring program more than 13 years ago by my very good friend and colleague Prof. Dave Schoellhamer (USGS). I am a marine geoscientist from the UK research company HR Wallingford (and professorially affiliated to: Uni Hull, UK; Stanford Uni, USA; Uni Delaware, USA; Uni Florida; TU Delft, Netherlands; and teach at Uni Plymouth, UK) and I specialize in cohesive sediment dynamics. I was most fortunate to be invited to participate in numerous RV Polaris then RV Peterson full BD cruises and collect some excellent data on sediment dynamics throughout the BD system. This has to date produced a scientific paper published with Dave in the journal Marine Geology, plus contributed to numerous conference papers and book chapters, with more in preparation. These cruises provide a truly unique insight into a highly complex and interesting location that is the BD system. With many aspects of the marine environment changing, I feel that such continuous seasonal scientific research monitoring transects are vital for future long-term sustainable management (including informing policy guidance) of the BD system. Long may the BD cruises continue! USGS financial support through replacement of Jim’s role would be cost effective for the nutrient stakeholders and would be preferred. Bay Area POTWs have plenty of money and lower rates than most of the rest of the country. The additional costs to replace USGS range somewhere between a penny and a dime per capita per year so this isn’t a crisis. Bay Area annual monitoring costs of $4 million pale to the >$25 million spent by the Delta’s monitoring program (IEP). More crucial for ratepayers is better coordination of all the disparate monitoring requirements of all the agencies dealing with the Delta and Bay. The SF Water Board has done a great job working with the RMP parties to set spending priorities, but Sacramento is a much more complicated beast. Cloern and colleagues did three things in particular that set them apart. First, they embarked on the long-term monitoring program that provided a longitudinal view of changes in an estuarine system that is truly unique. Second, they insisted on doing extremely rigorous science and publishing it in the most prestigious journals thus bringing great credibility to their work. Finally, they recognized early the importance of interdisciplinary collaborations to make headway on answering really tough ecological questions. Jim loved working this way and it paid huge dividends for all of us. He and colleagues put in place an infrastructure that will endure if the right leader can be recruited to lead it.This program has demonstrated the importance of “government science”. Incredibly talented people who are driven to do the best possible work because they believe strongly in the mission. They are critically important partners to those of us in academia because they bring a long-term view and resources that are invaluable to scientific discovery. How can anyone walk away from this program now? It would be an absolute travesty. It would be a disaster to lose this program. This has been one of the most valuable sets of monitoring data and research in the estuary. The Interagency Ecological Program has basically ceded the salty parts of the estuary to the USGS. If this program goes away, this fabulously informative time series will end. In general, it’s important to recognize that only governments can maintain long-term monitoring programs. These programs generally must be mandated to be maintained (contrast IEP with its Water Board mandate with this USGS program which has been kept alive through Jim’s perseverance). These long term monitoring programs are most valuable when coupled with a large and productive research community who can help with program design, participate in research building on the monitoring data, keep program staff engaged and scientifically current, and suggest and develop additional or alternative approaches. 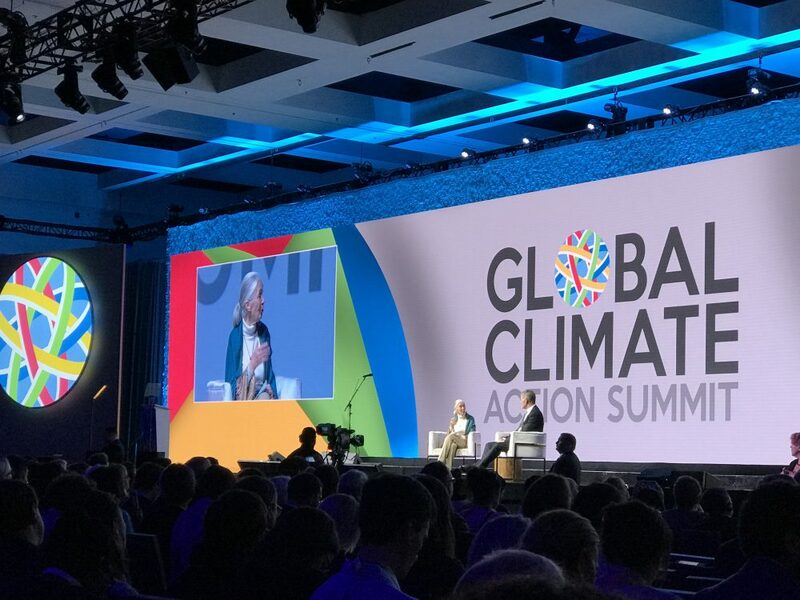 In the broader Bay Area we are particularly rich in scientific community and any governmental investment in continued monitoring would have a tremendous multiplier in terms of knowledge gained (and management errors forestalled).